Wolfe's Neck Farm in Freeport. Maine has over three million acres of conservation land. 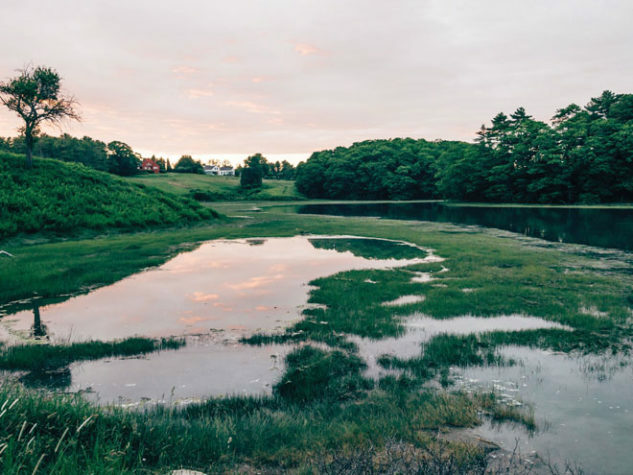 According to Dave Herring, executive director of Wolfes Neck Farm, the protected mountains, rivers, beaches, and islands are part of why we call Maine home. A lot of us are here because we wanted to maintain a quality of life that perhaps we couldnt maintain in urban places and that quality is dependent on having open space, he says. But the credit goes to the foresight of those who came before us, says Nik Charov, president of Wells Reserve at Laudholm. Land conservation is planning for the future, says Charov. A lot of money can be made through development, but then where do you walk, breathe, recreate, and stretch out? Thats what makes Maine such a special place. I dont think you can un-pave paradise. All nine of these conservation lands were created by someone with passion and respect for the outdoors as well as the vision and compassion to save the area for the future. Wells Reserve’s 2,250 acres span the coast of southern Maine and beckon explorers with coastal and forested trails. When you pull up to the property, the first landmark is the grand yellow farmhouse and accompanying barn. This history of the site dates back to 1643 and Henry Boade, a founder of Wells. The land has long been seen as a gem by the surrounding community. In 1978, when the fate of the land was uncertain, the town banded together to preserve the property. President Nik Charov says the surrounding community uses the land for hikes on seven miles of trails, but also for social gatherings such as concerts, events, and talks. On a clear day the trails of Sugarloaf Mountain have an expansive view that reveals miles of trees, mountains, and open land. The seven summits of Bigelow Range and Flagstaff Lake constitute the 36,000 acres of Bigelow Preserve. A ski resort was proposed in the region, but in 1976, the development was voted down. Today there are trails, canoe routes, and endless camping spots. “The more clearly we can focus our attention on the wonders and realities of the universe about us, the less taste we shall have for destruction,” wrote Rachel Carson in her book Silent Spring, which influenced conservation and environmental thinking in the 1960s and 1970s. In her honor, the Rachel Carson Wildlife Refuge has 50 miles of coastline and over 5,000 acres of forests, beach dunes, meadows, and salt marshes. The entire area protects plants and animals found only in this region of southern Maine. Lane’s Island has 45 acres of protected land that can be explored from dawn to dusk. From the shore, spot seaducks, such as eiders, and shorebirds, and even the occasional puffin. Along the trails find bayberry, meadowsweet, raspberry, and blueberry bushes. The island is close to downtown Vinalhaven and connected to the mainland by a causeway. There’s one bridge from Jonesport to Beals, then another that connects to Great Wass Island Preserve in downeast Maine. The five-mile-long island is remote and wild and has four different trails that wind through woods and open up to Cape Cove, Little Cape Point, and Mud Hole. Seals sunbathing on the smooth rocks are a common sight. In the early 1900s, Dr. David Todd and Mabel Loomis Todd realized that Hog Island’s forests and coasts were special, and they negotiated with landowners to purchase and conserve most of the island. When the couple’s daughter inherited the land in 1932, Millicent Todd Bingham partnered with National Audubon Society to save the land from further development and since it has been a site for ornithological studies. In 2010 the Puffin Project was established on the island, through which Dr. Stephen Kress successfully brought puffins and terns back to the islands of Maine. The Alewive Woods Preserve has colorful wildflowers blooming in the spring and ripe blueberries for picking in the summer. With 625 acres of land and a 45-acre pond, the land is beautiful to explore on the trails that run through its center. Visitors can also fish on the pond and, in the colder months, cross-country ski and snowshoe along the trails. The Bates-Morse Mountain Conservation Area has about 600 acres owned by the St. John family, Bates College, and the public. Each year students from regional schools as well as the college visit the land to learn about the surrounding environment, but also use the property for its natural backdrop with picnics and gatherings. About 20,000 people use the trail that leads to the sandy, pristine shores of Seawall Beach.